Yoga is an old Sanskrit word meaning union or wholeness. And wholeness was really what I experienced during three days at the Scandinavian Yoga and Meditation School’s Haa Retreat Center in Hamneda, South Sweden. The course center lies in a beautiful area and it felt wonderful to be there – entirely removed from stress and demands and I was completely able to concentrate on what I was there for – to learn yoga. As quoted from the book Yoga, Tantra and Meditation in Daily Life, by Swami Janakananda. After participating in a three days course in yoga, I understand what that means – to transform and expand the human consciousness. I am much more conscious of my body and my thoughts, and feel I have received a fantastic tool to meet myself with. This does not, in any way, concern running away from what is difficult, some kind of ready made positive thinking – no, it is more about being yourself and daring to be so – a natural way of getting to know yourself and to well-being. My first course in yoga started with an intestinal cleansing (not something obligatory to take part in the course) but I did everything directly. A certain number of glasses of saltwater and simple exercises; the water flowed through the intestines instead of through the urinary tract, which I experienced as a wonder and a great release. After a beautiful afternoon’s rest, the course started Friday evening with an introduction by two very pleasant and professional yoga teachers: Turiya and Swami Ma Sita. 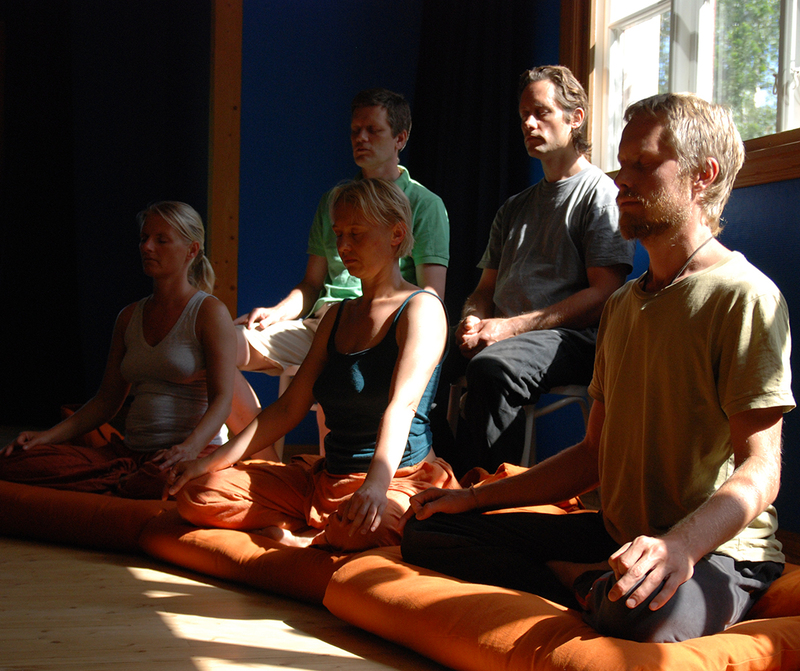 Slowly and softly, we were led into the world of yoga, movements, breathing exercises and relaxation. When I went to bed the first evening, I felt a great peace and slept the whole night, which I had not done for a long time. I woke at 6 the next morning and felt surprisingly fresh. We met in the yoga room at 7 o’clock and started with a candle meditation. 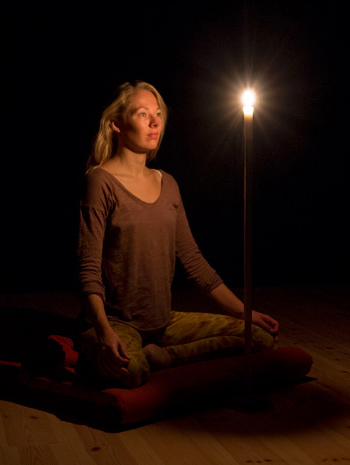 This involved gazing at the flame of a candle at eye level whilst sitting crossed legged in a yoga pose. After a while, we blew out the light, closed our eyes and the flame’s after-image appeared on the retina. We were instructed to move the after-image to a point between the eyebrows. After having done this a few times during the stay at Håå, it was easy to move the flame and really be concentrated. Afterwards, as mentioned, followed two days of intensive physical exercise, breathing and meditation exercises. Weeks afterwards, I still long for the yoga room. In that room, I have done exercises that I thought impossible for me. I get up every morning now and do my yoga exercises for half an hour. If, sometimes, I find I do not have time for it, then I do it in the afternoon. The yoga course in itself has helped me to take that time for myself. I feel an increased sense of well-being, greater concentration and inner harmony and a very noticeable effect is that I lost 3 kg; I have no desire to stuff myself unnecessarily. I have a strong feeling when there is something the body does not want. Increased awareness, it is called. I do not experience this as something mystical – but as something natural. The physical exercises make me more aware of my own body. Here, I gain both strength and training of the muscles. My lung capacity has increased due to the breathing exercises, I breathe in the correct way nearly all the time (it takes time for women) and the meditation exercises are delightful and really something a modern person needs. The best of all is that I can do a little or a lot, I am not fixed to one particular programme. Already after three days at Håå, I know enough exercises to be able to benefit from them. And it is exciting and developing – a way to remain balanced and participate in what is happening. This three day course is sufficient to be able to use yoga for a very long time to come, but I am sure it will not be long before I go on their ten days course – we shall see – there will be a report about that! I shall return! Camilla Sternberg is the editor of SMRF’s members periodical The Masseur. This article is printed in The Masseur no. 4, December 1994. Swedish Masseurs Union, SMRF, is an active union for approximately 550-600 masseurs from the whole of Sweden. To be a member of SMRF, attendance of a school that fulfils SMRF’s demand on education, qualitatively and quantitatively, is a must. SMRF also demands obligatory further education every year. SMRF masseurs also have a role at various official sporting events.